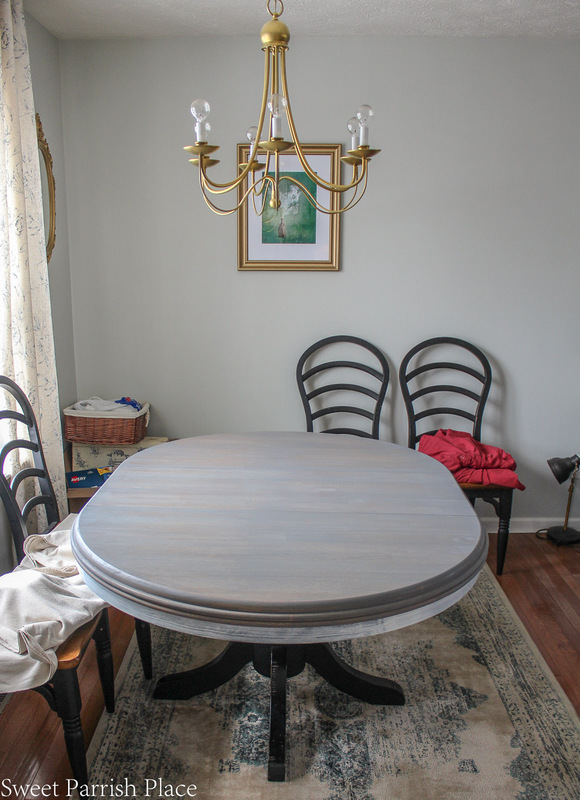 Consider this a first glimpse of my dining table makeover progress for week 3 of the $100 Room Challenge. Hey friends! 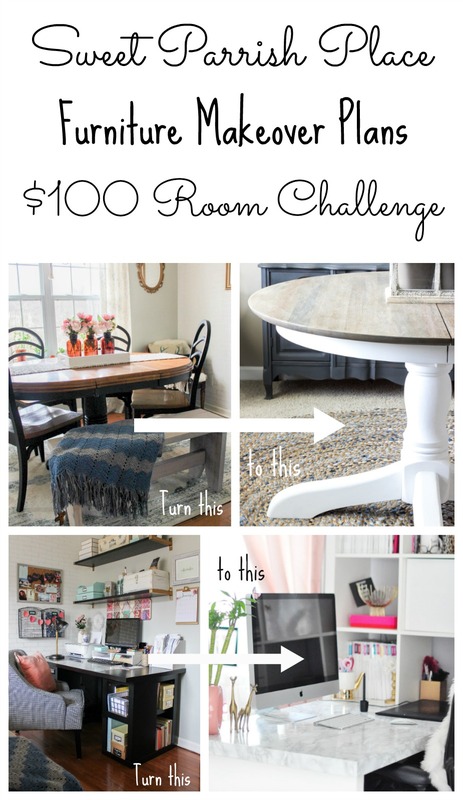 It’s week 3 of the $100 Room Challenge, and I’m feeling fairly good about my progress. I feel like I got a lot done, considering I had one full day to work on projects this past week. However, I am nowhere near finished with my dining table makeover. 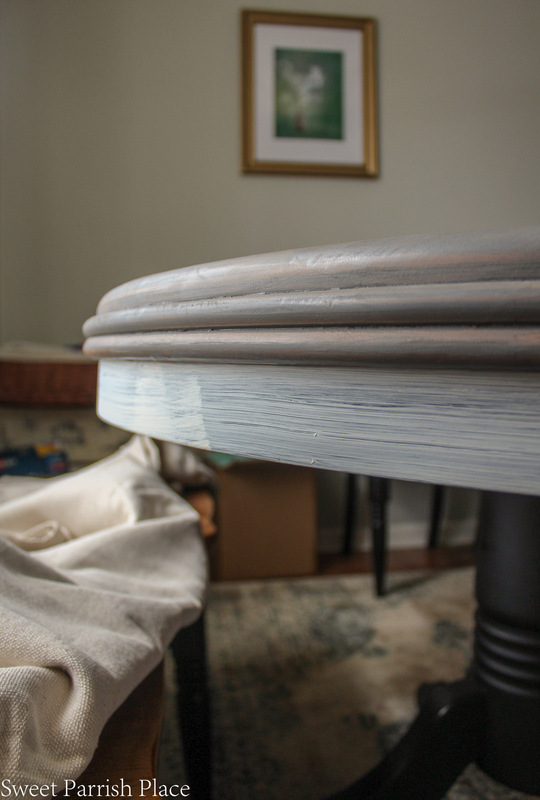 We are halfway through this challenge, and I feel like I am about halfway finished with this table, ha! I still have to paint the chairs and certain parts of the desk and shelves. 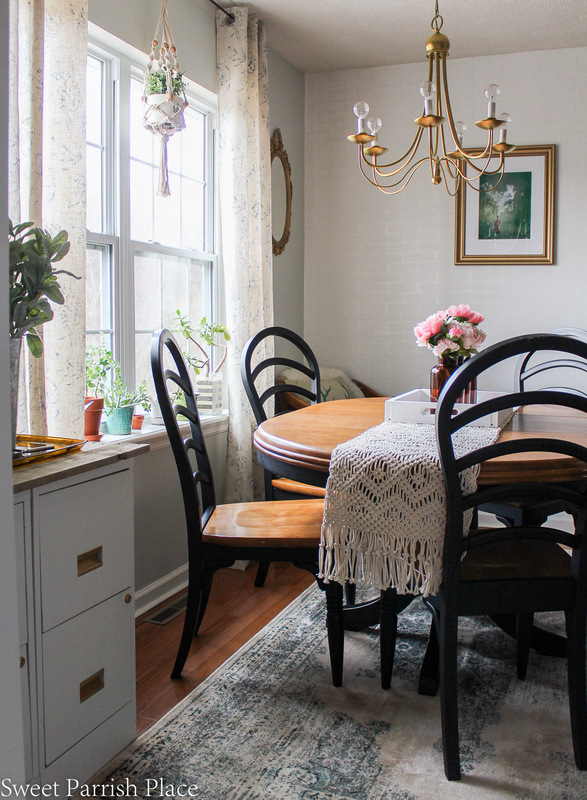 Keep reading and I’ll fill you in on the details and show you what’s up with my dining table makeover progress! First, you should totally check out week 1 and week 2 of this challenge! That way you will be up to speed! I have also been sharing a lot about this room refresh in real time on my Instagram stories. You can find this dining table makeover in my Instagram story highlights under dining table. 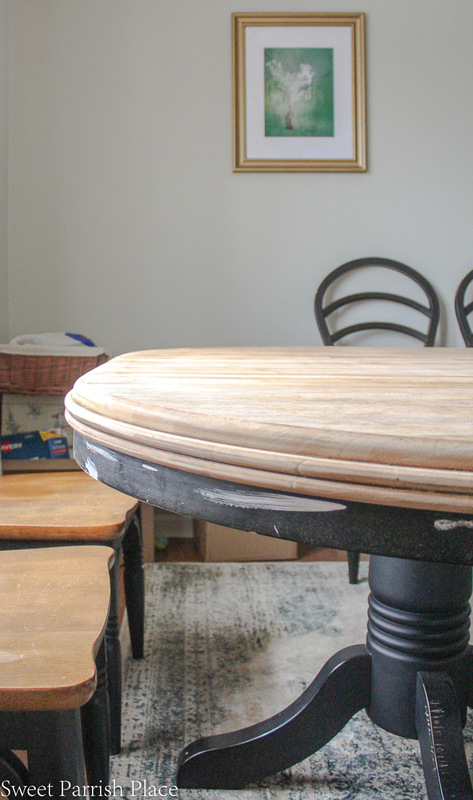 Below are a couple of before photos of our dining table, which I have owned for over 15 years. It was very well worn in, and the top was showing its age. It had tiny paw scratches all around it, from our dog. Honestly, it looked way better in photos because I could hide them. But in person, not so much! Last week, I posted this collage with some inspiration photos for our table and our desk. And on Friday evening and Saturday, I began stripping the original finish from the table top. It went much easier than I imagined! I began by painting on a product called Citristrip. I borrowed this product from my next door neighbor, who is a professional painter. I painted it on and then let it sit overnight. I read that it would stay wet and active for up to 24 hours, so I painted it on Friday evening, and then I scraped it on Saturday morning. I didn’t realize until after the fact, that I should have covered it with plastic wrap before I let it sit over night. When I went to begin scraping it with a plastic scraper, it was too dry, so I had to paint more on. I immediately began scraping it as soon and I painted it on the second time, and the varnish just came right off pretty easily. I then used my hand held sander to sand the table down to the natural wood. It was way easier than I had bargained for. You can see what it looked like afterwards below. There were a few stubborn spots, and my husband used some of his manly strength to sand those spots. 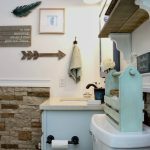 I loved the way it looked with the natural wood. In retrospect, I maybe should have sealed it up right then and there. But I didn’t. I decided to go forth with my plans to use the weathered gray stain from my inspiration photos. 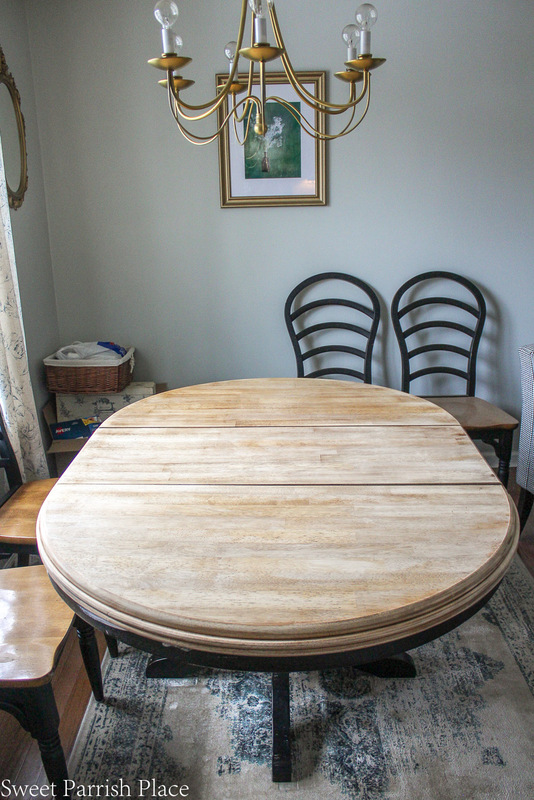 Except my plan got waylaid when I went to Home Depot to purchase my Minwax Weathered Oak Stain which is what the blogger in my inspiration photo used on her table), and I found out that Home Depot doesn’t carry Minwax anymore. So I chose the Varathane weathered oak stain because I didn’t want to go to another store. Was that a mistake? I haven’t reached a conclusion quite yet. I am withholding judgement until the table base and chairs are all complete. But for now, I have not sealed it. I did give the apron of the table one coat of white primer, and I will be painting the entire table base and the apron with white chalk paint. Here it is with two coats of the weathered gray stain. I painted the stain on with a brush, in small sections at a time, and then I wiped it back off with a cotton rag. It took me a few times to figure out how much of a section to do before wiping to get the look I wanted. Therefore after the first coat is looked sort of blotchy. I wasn’t happy with the consistency after one coat, so I lightly sanded it and applied a second coat. the second time I painted the stain on in smaller sections, and wiped it with the cotton cloth more frequently. I wish I had done it exactly that way on the first coat, but bygones… I feel like it might be a tad too dark. I will decide what to do about that, if anything, when the rest of the table is finished. And probably also after the desk is finished. Because the gray may grow on me as I add more white to the space. So time will tell. If all else fails, I can always sand it down until I am satisfied. You can still see the wood grain through the grey, but I wish it were a little lighter of a shade of grey. The Minwax is supposed to lighten as it dries. The Varathane did not do that , and I was praying it would. This is a killer busy week for me, and I won’t have time to work on things again until Friday evening. But I do have a three day weekend coming up, and I am so thankful for that! Because there is much work to be done on my dining table and desk area. I ordered a new area rug, and I had it delivered to the store. I received a notification that it is ready for pick up just this morning, so I am anxious to see it in person and know whether it will work for this space or not. This is the rug if you would like to see it. I had a $50 gift card from JC Penney, and the rug was on major sale, so I ended up paying only $41.75 for the rug. Thanks for popping by and checking out my progress, and I hope to have a finished table by the time next week rolls around. I also hope to have begun using my paint sprayer for the rest of the chairs and shelves. I will also be applying the contact paper to my desk top. I had planned to do that on Saturday, but ended up not having enough product. So I put it on hold until I could get another roll of contact paper. Am looking forward to seeing how your table turns out. I like the gray. Will have to note Citristrip as I have never heard of it and it seems like a product that would make things a lot easier. I was working in a closed space in the dead of winter, and this was supposed to be more natural. It has a citrus scent which wasn’t not intolerable, but it did give me a headache after a few hours so we moved to the bedroom for the evening. It was good to use in an enclosed space. The smell wasn’t nearly as bad. Although the citrus started to get to me after a couple of hours. What!? Home Depot doesn’t carry Minwax anymore! That’s super surprising to me. I’ll remember that for the future! This turned out so amazing, I’d be so proud to showcase that in my house! Thanks Jenn! I know, I am shocked as well. And I asked about it at Home Depot, I didn’t just assume. 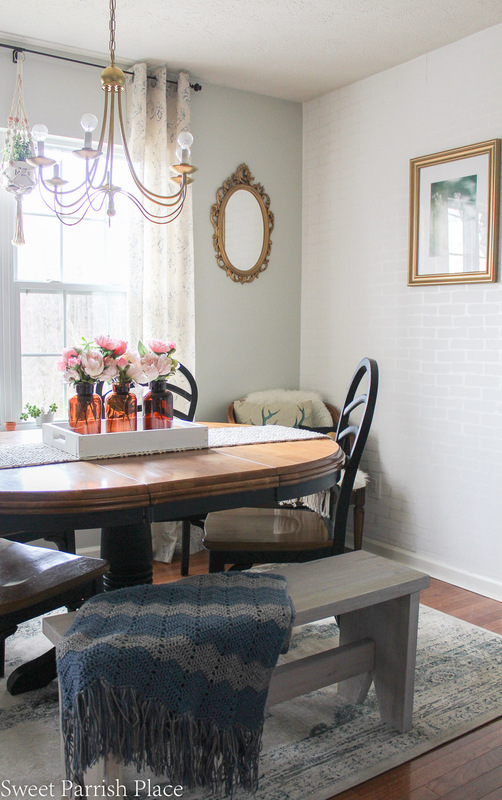 Nicki I love what you are doing with this table, I have plans to do something similar soon to a living room table that needs a need life, so I was reading every detail on the how to’s. Thank you for the candid details and I had no idea about the minwax at HD…. still in shock! Thank you so much! I hate it that I liked it better with the natural wood look than I do after I stained it. I’m kicking myself. But I am going to continue because once the base is white I may feel totally differently. Once the table is painted, if I still don’t like it, I’m breaking the sander back out. But the Citristrip worked great! I love the way your table is coming along! I’m a huge fan of the gray weathered look. Can’t wait to see more! Thanks Marly! I’m still a little nervous about it, but I can’t wait to see what it looks like once the entire base is white. I’m planning to start painting it tonight! Nicki, I think the gray weathered look is beautiful! I am so excited to see how your whole room turns out! Wowwww! I am really a fan of gray weathered and I can’t wait to see how will it turns out!!! It is going to look so good!! Can’t wait to see this space transformed!! I don’t think the gray looks bad at all, but if you wanted to tone it down a little you could try a whitewash over it too. Good luck! I absolutely hate painting out chairs but a sprayer does make it much easier! You got quite a good deal on the rug! Can’t wait to see the finished project. 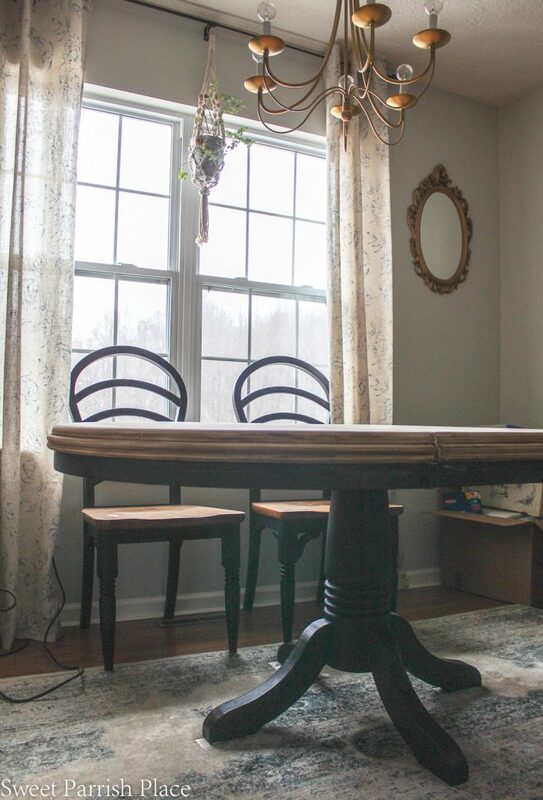 I have a dining table in need of a makeover too. Love your colors! Stopping by from Merry Monday. Thanks so much Shirley! I love finding a great deal!